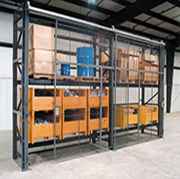 Existing facility pallet racks can be completely enclosed with standard wire mesh panels and doors to secure and control high value inventory. 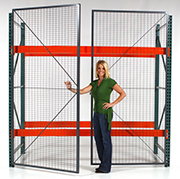 Modular sized wire mesh panels are quick to install and are inherently stronger than competing pallet rack enclosing systems. 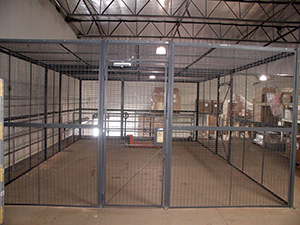 WireCrafters panels and doors are made of 10 gauge wire welded in a 2″ x 2″ square mesh. The wire mesh is then welded into a 13 gauge rolled formed angle frame. Pallet rack enclosure end panels are attached to the pallet rack end with flush mount angle clips. 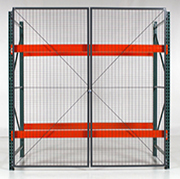 To separate multiple bays, end panels are manufactured with a flat frame which allows the panels to be attached to the pallet rack end with self tapping screws. Back panels are also attached directly to the rack with angle clips. WireCrafters stocks three different mounting clips that allow an offset which ranges from flush mount (or no offset) up to 6″. These mounting clips allow your pallet load to overhang but still maintain inventory security and safety for workers. 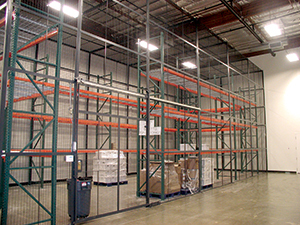 Offset clips come in lengths up to 12″ long which allows you to mount panels between back-to-back rows of pallet racks, providing a strong and secure wall to two rows of rack simultaneously.